Researchers are rolling out a glove that allows a doctor to monitor a patient's exercises when they are at home. A stroke occurs when your brain doesn't get enough oxygen due a blockage in the blood vessel which can result in some pretty serious damage to your nervous system. Stroke-sufferers can become paralyzed or lose fine motor skill in the hands or feet. Recovering from a stroke usually involves intensive physical therapy that can be very costly for both the patient and the doctor - especially since such therapy is usually just boring and repetitive motion until the brain relearns how to control muscles. To alleviate some of the hassles of physical therapy, a joint program at McGill University in Montreal developed a glove that tracks the movement of the patient's hand and sends that information to the doctor in his office. 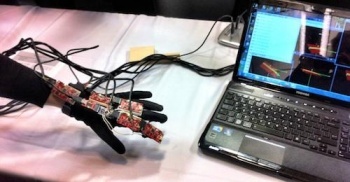 Using the "Biomedical Sensor Glove" will allow a doctor to lightly supervise recovery while the patient is able to exercise more regularly in the comfort of the home with game-like interface. In all honesty, the "videogame" is likely just a representation of the movements on a screen. I'd like to see a designer take up the challenge of developing a simple game that allows stroke victims to exercise without going completely mad. Such a game probably won't ever see mainstream success, but it surely break the monotony. I've underwent physical therapy when I dislocated my finger playing basketball, and I got to tell you that clenching and extending the same finger 100 times gets old pretty quick. Plus, that thing looks just like Nintendo's Power Glove. It's so bad.